These rag and bone jeans are my favorite ripped skinny jeans. I found an almost identical pair for $39 and I might have to order them for myself as well. I also found some other really great inexpensive destroyed skinny jeans that I love. I might have to order myself a pair because they all look so cute. 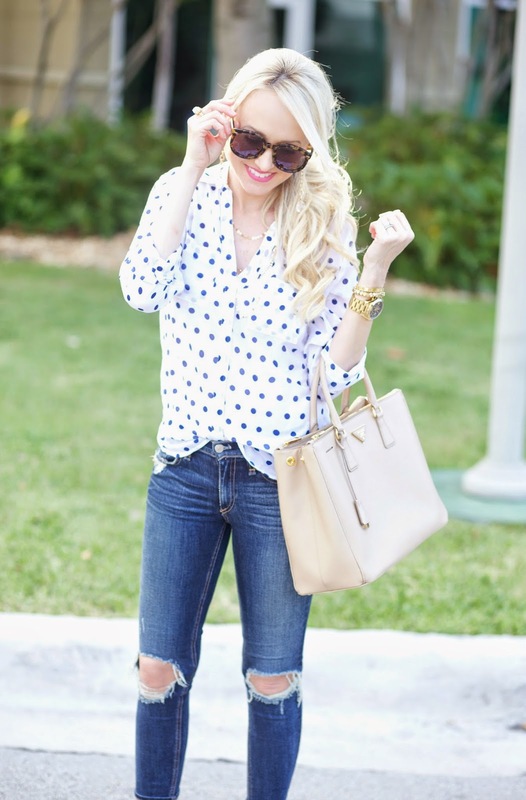 I love this simple blue polka dot top. This type of outfit is my go to on a daily basis. Such a cute everyday look! That polka dot top is really sweet! stunning as usual! those jeans fit you like a glove! 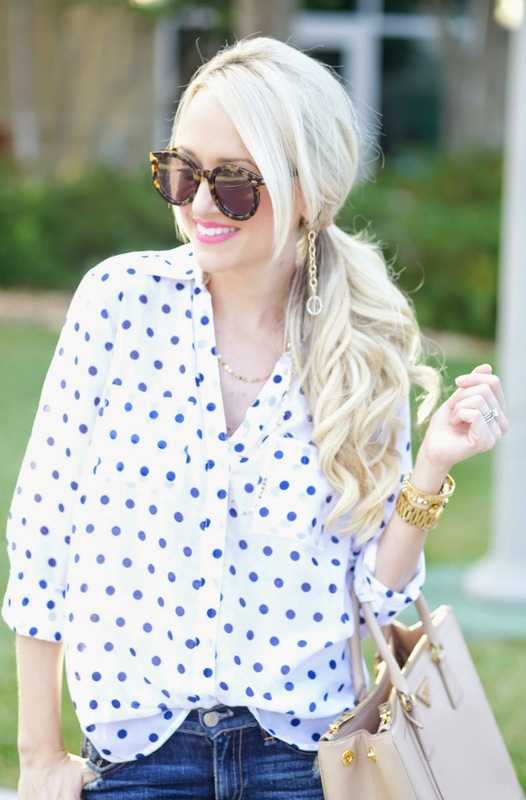 Love your polka dot shirt! Absolutely love those distressed jeans!! And I'm pretty sure that top needs to make it into my closet asap! I am looooving those shoes! Such a cute, casual outfit! Your blouse is fantastic! I love your sunnies! You are rocking those heels! Very nice & classic outfit. This is such a random question, but I always love all of your jeans and how they fit you. I was wondering how tall you are? I'm 5'2" and very petite. I always have a hard time finding jeans that fit tight all the way down through the shins if that makes sense. If you find the time to answer, I would appreciate it! Love your blog and have been following for years! I know many women that are similar in height to you (usually Asian women) and they find perfect fitting jeans, tight all the way down to the ankles. It is possible to get some jeans with a 26" inseam with these being more of a cropped style than the typical 7/8 length jeans which offer 28 to 29" inseams. Often these styles feature ankle zippers which allow a snug fit at the leg openings. Various brands are avaialble on the market, though I have to confess that I am not in the US so when I say market, I am referring to overseas markets. I have helped some "petite" friends in various different countries source the perfect fitting jeans, so let me know if you can't find what you are looking for and I'd be happy to help out. I also like the blouse. The spots (or should I say polka dots?) provide a refreshing look when contrasted with the blue denim and then offset by the white heels - awesome combination. You look absolutely fabulous in skinny jeans. The link to the $39 jeans isn't working - can you let me know where they're from? Love this look! Your polka dot top is super cute!! I really like that lip color - what is it? You look amazing. I love the polka dot shirt! Your outfit is so lovely. I love the polka dots. That's a trend I definitely want to add to my wardrobe.